The ultimate eye protection from sun exposure while driving! 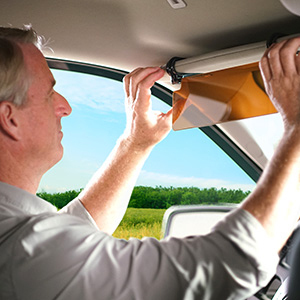 Replace your interior car visor with Atomic Beam BattleVisor that lets you see the whole road clearly which help shade your eyes from the glare of sunlight. This Battle Visor is a transparent visor that blocks the glaring sun and allows drivers to see the road in a crystal clear high definition that will keep you safe on the road! Battle Visor works effectively through its atomic clarification technology, which can filter out things that might get in the way of your view, such as UV rays, blue rays, and unexpected light glares. 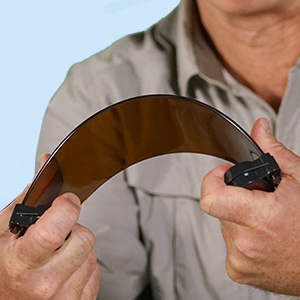 Why you should replace your ordinary car visor? Battle Visor can be installed, uninstalled or re-installed in seconds, you'll be able to transfer it between vehicles if you'd like. Just unhook its hooks from your current vehicle's built-in visor, walk it to the next vehicle and pop it on there, and you'll be good to go. Each Battle Visor is made of strong, durable material that likely won't break if it's accidentally bent. Attach your Battle Visor to your existing built-in visor by using the visor's two hooks (one on each side). Each hook will clip onto one side of the built-in visor. Flip down the new visor and adjust it to suit your eye level. To do so, pull it down a bit so that the new visor lowers with it. Once your' new visor's at the right height, you'll be able to see clearly at any point during the day, no matter how sunny it is out or where you're driving.